A hearty meal in a bowl, ready in minutes. Melt the butter in a large pan and add the leeks and potato. Cook them for a few minutes until they are well covered in butter. Add a splash of water, then cover and sweat the vegetables over a medium heat for about 10 minutes, until they are soft. At the same time, put the haddock in a pan and cover with the milk. Bring to the boil, then turn down immediately and allow the fish to poach gently for about 5 minutes. Lift the haddock from the pan with a fish slice and, when the fish is cool enough to handle, remove the skin and fl ake the flesh. 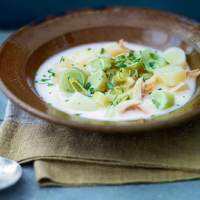 Add the stock, poaching milk and flaked haddock to the potato and leeks. Season and heat through. Serve with the parsley scattered on top.